Fitbit for Windows Phone is a great app and if you are a Fitbit Flex, One or Zip user, life just got a whole lot more integrated with your Windows Phone. If you know me or have followed me here or on AlliOSNews for any amount of time you know that I’m a big fan of Fitbit. The wearable tracker helps me keep track of my activities for the day as well an integrating into MyFitnessPal, my diet tracking app. Back in 2009 I started a weight loss program that would see me go from 290 lbs to my current weight (as of this morning) of 191.3 lbs. Yes there was a lot of hard work involved by Fitbit helped me without a doubt. One of the really exciting parts aspects of Windows Phone 8.1 is Bluetooth LE which allows things, like a Fitbit, to connect to your Windows Phone and sync automatically on-the-fly. So it only makes sense that there would now be a full fledged Fitbit for Windows Phone 8.1 app available now that takes full advantage of this update. 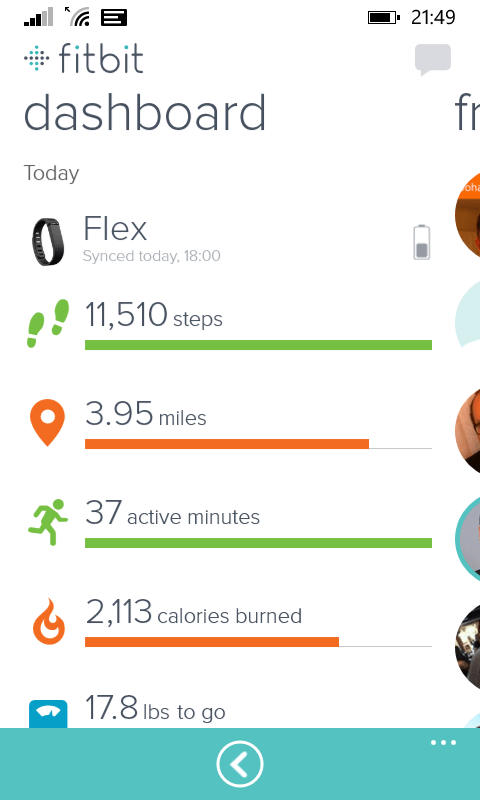 If you have been a Fitbit user on Android or iOS, you will feel right at home with the app on Windows Phone. It is identical in every way and even gives you up-to-the-minute updates thanks to the Live Tile for the app. Cyan and Windows Phone 8.1 are what enable Bluetooth LE on your Lumia. 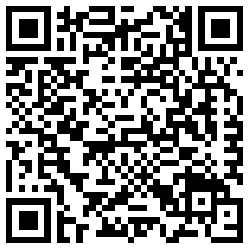 While you can certainly load and use the app on a phone running Windows Phone 8, you will not get the real time sync with your Fitbit One, Zip or Flex. This also means that if you have done the Developer Preview on your Windows Phone and have Lumia Black still running, nope, it won’t work. That only got you Windows Phone 8.1 the OS. If this is all clear as mud, give my Lumia Upgrade Guide a read and hopefully it’ll clear things up a bit. 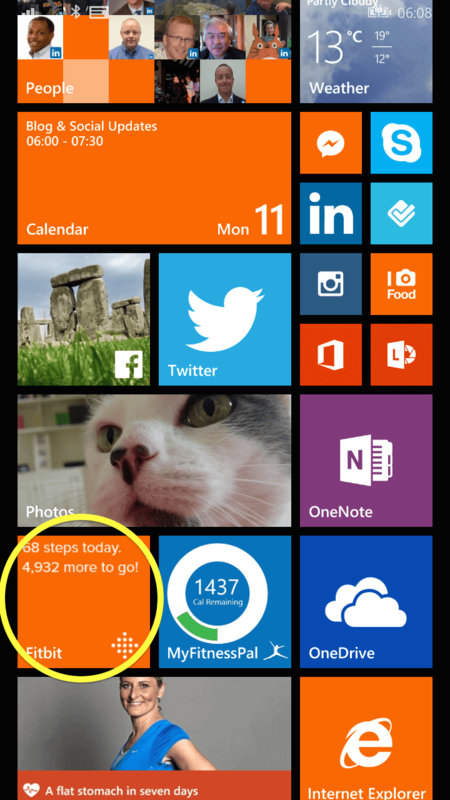 When you first start the Fitbit for Windows Phone app you will be taking to your Dashboard. Here you will see all of your statistics for the day and how you are doing against your various goals and targets. 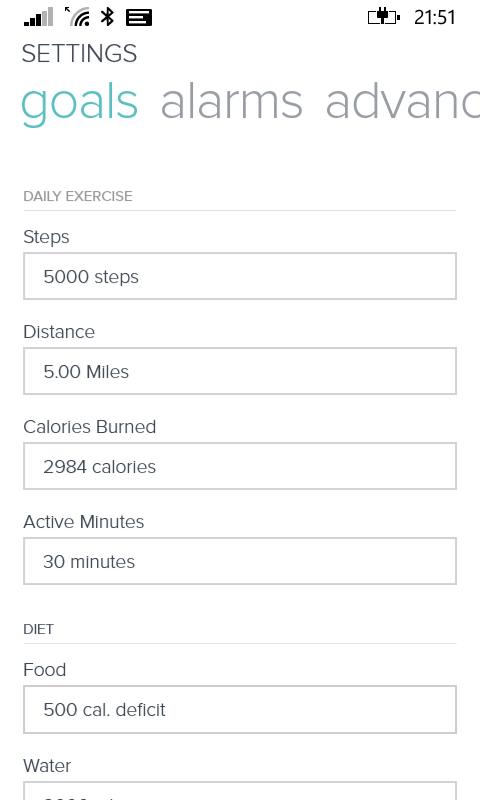 These goals and targets can be set either within the app itself (Settings>Goals menu) or on the Fitbit website. In order to get your Fitbit One, Zip or Flex to synchronise with your Windows Phone, you will need to make sure that you have Bluetooth enabled. By default it is off so swipe down on Action Center, tap All Settings and scroll down to Bluetooth and enable it. You do not have to pair your Fitbit with your Windows Phone. The app and the phone will sort that part out for you automagically. Back in the Fitbit app, it should start looking for your Fitbit and synchronise with it. You can always force a sync by tapping the menu button and tapping Sync Now. Your Dashboard is the keeper of all information for you when it comes to how you are performing against your goals for the day. As you walk and do other exercises, the Fitbit for Windows Phone app is in regular communication with you Windows Phone to help you keep track and on target. It even provides this information to you in the Fitbit Live Tile so at a glance you know where you are on your steps. The Fitbit for Windows Phone app, like on other platforms, allows you to track more than just your steps and activities for the day. Slide over to the Activity page (swipe right from the Dashboard) and you can now track other things such as your water consumption (water is key for weight loss & maintaining as well as overall health), log your sleep, log other activities such as exercise in the gym or a long walk or run) and set an alarm on your Fitbit to wake you or remind you of something. 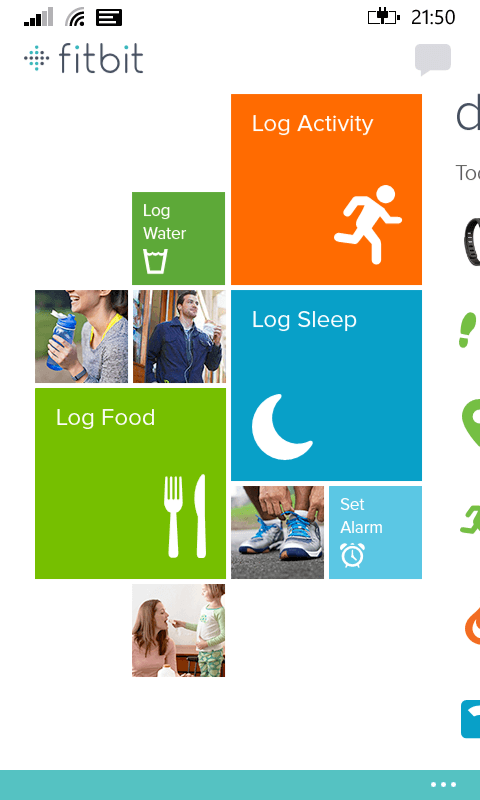 Fitbit for Windows Phone can also be your food and diet tracker if you don’t want to use another app like MyFitnessPal. In my mind this is the weakest link for the Fitbit app regardless of platform. The food log is somewhat limited when it comes to the database of food items and, if you live say in the UK, it is really limited. Personally I use MyFitnessPal for my dietary logging and recommend it over the Fitbit version. You can sync your Fitbit and MyFitnessPal accounts so information from MyFitnessPal is automatically fed into Fitbit. Just go to your MyFitnessPal account on the web to set it up. What fun is exercise and staying healthy without a little friendly competition eh? 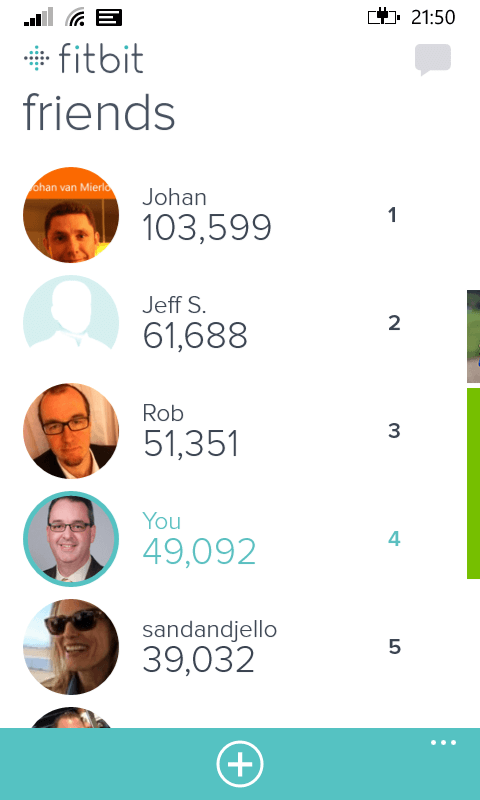 Fitbit for Windows Phone also allows you to add friends so you can see how you are doing against them at any point. You can add friends by going to the Friends page (left swipe from the Dashboard) then press the Find Friends function. The app will then go and search your contacts for friends with and without a Fitbit. You can then add them and see how you fare against them on a rolling 7-day basis. One of the things I like about the Fitbit for Windows Phone app is the ability to really see your trends on your activities. If I’m on the Dashboard and I tap Steps, I will be taking to a deeper page which shows me a bar graph of my step totals over the course of the last month. It will also tell me thanks to a green checkmark if I achieved my target for steps on a particular day. You can do this for just about everything on your Dashboard so you can really understand how you are performing on a day-by-day basis. Trends of good habits and exercise are what lead to a healthy lifestyle, not one off days. Having been a long time Fitbit user on iOS I find that Fitbit for Windows Phone is on par with everything in the iOS version with the exception of a GPS activity tracker. This is a relatively new feature in iOS to be fair so it could be that the Fitbit folks will add this in an update later. To be fair, it really isn’t that big of a deal to me as I generally use RunKeeper to track my walks and runs. I fully admit I came into this review expecting that I would be somewhat disappointed by the feature set of Fitbit for Windows Phone when compared to other platforms. Happily, I was wrong. It has all the features and functions you would have expected from Fitbit and the app is easy to use. Fitbit for Windows Phone is a free app and requires that your device be running Windows Phone 8.1 and that you have a Fitbit One, Flex or Zip as your tracker.